This unique DS design offers a multi-purpose design that function as both a stylist smock and a client robe. 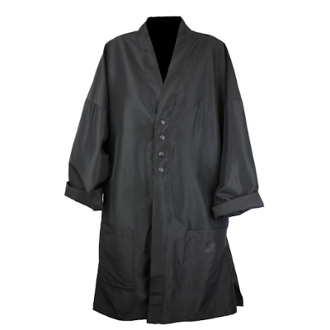 Pamper your client by wrapping them in this beautiful robe, or use as a protective and stylish, stylist smock. Made in DuraSilk™ luxury material that is a soft, silky, lightweight, professional performance material. Easy on, easy off, 4 snap closure, oversize cut that will fit most sizes. Long lasting, professional stain resistant fabric that holds its color wash after wash. Easy Care, machine wash. One size fits most.